It’s a record-breaking heat on a recent Sunday, and Liberty Park is mobbed by picnicking families, drum circles and extreme Frisbee teams. But not everyone is here for play. In one corner, a motley crew of activists from various groups, including Peaceful Uprising and Occupy Salt Lake City, train on how to politely get arrested. They get a crash course on their rights to silence and against unreasonable search and seizure, and how to tell the difference between being detained and being arrested. One participant, who had been arrested before, advises his cohorts not to have their cell phones confiscated by police and to prepare for their one call from jail by writing their lawyer’s number upside-down on their stomachs with a permanent marker. It’s just one tip of many from an all-day training session that also includes role playing, with activists pretending to be pompous legislators and businessmen trying to agitate the activists, while activists practice keeping their cool and staying on message. While the message of sticking it to the corporate man may not be new for these groups, what is new are the strong bonds being formed by progressive activists. For Peaceful Uprising, a group formed to fight climate-polluters in the aftermath of the arrest of bogus gas-lease bidder Tim DeChristopher, this means branching out to work on other causes, such as immigration rights, as part of its new “community audit” model of outreach. Occupy SLC is betting heavily on making a comeback in the community since its 2011 eviction from Pioneer Park by making a strong offensive against a group that could be described as its archnemesis: The American Legislative Exchange Council (ALEC), a group that partners corporations with state legislators to pass laws sympathetic to business interests. ALEC’s promotion of for-profit prisons and immigrant-detention centers, oil and gas development and other causes makes it a common enemy for Occupy and Peaceful Uprising to rally the troops against. At a recent meeting of Occupy’s ALEC Welcoming Committee, a small group strategizes how to “welcome” ALEC when the group holds its annual conference in Salt Lake City in July. The talk of the committee is of plans to boycott Utah’s ALEC-supporting businesses, trying to figure out where the group will hold its meeting (the meeting location is generally an undisclosed, closed-door meeting for businesses and lawmakers only), and assigning members to flier the city about ALEC teach-in events. With ALEC’s own literature boasting of helping draft more than 1,000 bills in state legislatures every year, Occupy needs time to educate activists on ALEC’s tentacle-like reach into public policy. But the education component of the group’s organizing is also part of what is helping the group solidify its roots within the state’s activist community. “It’s like this big common enemy we can all rally against, which is a huge way to build solidarity,” says Raphael Cordray, an Occupy organizer on the ALEC Committee who also runs the Free Speech Zone, a local activist shop. By working to connect the dots between bad businesses and myriad controversial laws, Occupy has more opportunity to work with different groups and vice versa. “The first time I went down to Pioneer Park, I felt so full of hope because I saw the possibility of all these groups coming together that had thus far been working completely isolated,” Lee says. Sharing a camp and breaking bread together gave many activists the opportunity to network, but it was also the group’s open and democratic meetings that helped differing interests come together. This model is one that’s, in part, also being adopted by Peaceful Uprising. While the group rallied around the direct action of now jailed oil & gas auction monkeywrencher DeChristopher, the group is also rolling out a new model of interaction called “community audits.” The plan is to rally behind four issues of injustice a year and also support four groups a year that are bringing hope to the community. Their current audit involved meeting with numerous activists to select the current injustice to rage against, which at the moment is proposals to extract petroleum from tar sands in the Uintah Basin in eastern Utah through a process activists worry will contaminate the ground water. On April 23, more than two dozen activists flash-mobbed the Utah Trust Lands Administration Office that leases lands for development to go into a public-education trust. 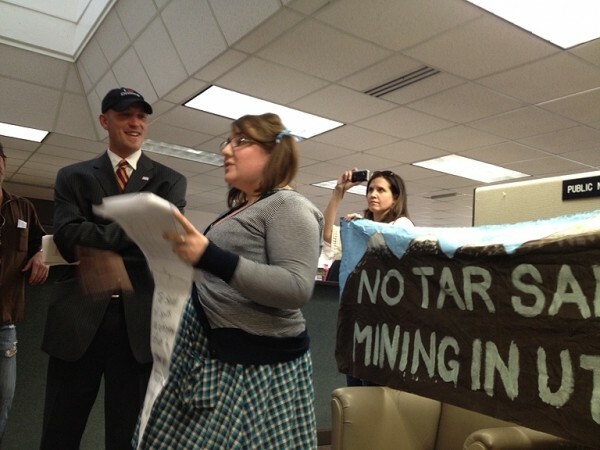 The activists performed some short guerrilla theater, with Lee, dressed as a schoolgirl, criticizing the state for shortchanging the environment for potential profits on tar-sands extraction. Their current audit’s cause of hope is supporting the Salt Lake Dream Team, a group of Latino youth activists who raise awareness of immigration issues. Kathy French, a professor of behavioral science at Utah Valley University, recently completed an oral history project, where she and her colleagues interviewed more than 150 Utah peace activists. She says groups that focused on a deliberative consensus-building process more than a set goal, such as anti-Vietnam War Quaker groups, helped develop lifelong activists. Henia Belalia, an organizer with Peaceful Uprising, says the plan for future community audits will be to find issues of injustice and hope not solely within activist groups, as their current audit has done, but to go door to door to communities and engage Utahns directly about issues they are passionate about. By incorporating Occupy’s big-tent approach, she sees Peaceful Uprising’s activist organization expanding its reach to become a “hub” for local activists. “That was one of the critiques of Occupy when it got started was, ‘What do you guys want? What are you pushing for?’ ” Belalia says. She says the lesson for Peaceful Uprising and other groups wasn’t about pursuing a single goal, but allowing lots of people to collaborate on numerous goals. “What Occupy has done is help communities learn participatory democracy. ... To learn to be with one another,” Belalia says.